Located in a restored 1900s-era farmhouse, French Girl Farm is a complete shopping experience that showcases gracious living at its best. The charming and eclectic boutique is filled with treasures that embody the grace, polish and welcoming spirit of true southern hospitality. Stepping through the screen door into French Girl Farm, you’ll discover an ever-changing collection of hand-picked antiques, home decor elements and seasonal decorative accessories, as well as all-natural bath and body products. At French Girl Farm, owner Dawne Jones has created a inspirational space that invites her customers to dream of the possibilities for their own spaces at home and then provides the stylish pieces to make those dreams come true. Everything is so exquisitely displayed customers feel like they are wandering through the home of their most stylish friend rather than a retail shop. And that is exactly the atmosphere Jones envisioned when she decided to open her own retail space. French Girl Farm is not your ordinary retail store; it is so much more. 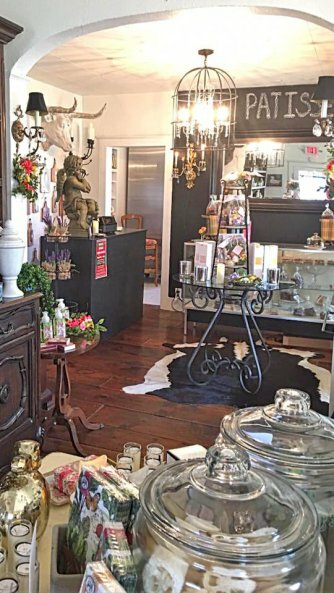 In addition to the beautiful home decor and gift items, French Girl Farm offers interior decorating services, event coordinating and confections. Coming soon will be a tea room serving homemade specialties prepared in the on-site commercial kitchen. A recent transplant to northeast Oklahoma from Memphis, Jones has a background in interior design and event planning. After visiting her son who lives in the Grand Lake area, she decided to move here to get away from the city and live in a smaller town. The restored 1900s farmhouse itself is what inspired Jones to open the retail shop. For more than three years, Jones has been making and selling a line of all-natural bath and body products online under the name French Girl Farm. The farmhouse on Main Street in Grove, which opened in October 2017, is her first retail property and the products are featured at the store. As for the unique name of her product line and shop, Jones says it pays homage to her French ancestry. The French Girl Farm bath and body product line is all-natural and organic. Handmade is small batches, the products are cruelty free, dye free, paraben free, natural and fresh with no harsh chemicals. The farm-fresh products are made in-house at French Girl Farm and feature essential oils, botanicals and other natural products, including goat milk, shea butter, aloe, sage, cilantro and sea salt. There are no artificial fragrances. Infused essential oils, such as lavender, rose, lemon, lime and more, account for the heavenly scents. The product line includes soaps, lotions, luxury bath salts and teas, body polish, scrubs, laundry soap and more. Perfect for yourself or a gift for a friend, the French Girl Farm bath and body products are designed to love your skin. In addition to its own line of products, French Girl Farm offers something for every taste and occasion from recognized names such as Lady Primrose, Vagabond House, Aromatique, Park Hill Collection, Mixture® and Sullivans. The selection of items available range from antiques to new items that will be tomorrow’s heirlooms. The selection includes furniture pieces, lamps, pillows, serveware, napkins, candles, potpourri, specialty items such as ironing water, reed fragrance diffusers and organic laundry soap. A woman of many talents, French Girl Farm owner Dawne Jones is also a talented baker. Luckily for patrons of her Grove shop, Jones enjoys sharing her beautiful and tasty creations with others. The confections counter at French Girl Farm is always filled with a scrumptious display of tasty treats, including specialty candies, chocolates and candied pecans, as well as a selection of packaged teas, coffees and special syrups. While Jones tries to offer a small selection of baked goods, the store will soon include a bakery section which will feature an array of delicious desserts. Baked offerings in the past have included cinnamon rolls, lemon bars, cheese danish, pumpkin streusel, chocolate chunk cookies and apple strudel. Once the tea room opens, French Girl Farm customers will be able to sit and have dessert and tea while shopping. The iced cookies from French Girl Farm are both beautiful and tasty. These custom-decorated sugar cookies must be ordered two weeks in advance, but are sure to be the talk of your next event or party. All of the confections, baked goods and decorated cookies are handmade in the licensed commercial kitchen at French Girl Farm, using the freshest and finest ingredients. The talents and skills Jones used to turn the 1900s restored farmhouse into a charming and eclectic boutique at French Girl Farm are also available to its customers. French Girl Farm offers interior decorating services for projects large and small. Whether you want to turn a single bland room into an elegant and welcoming space or want to makeover an entire lake house, Jones can transform your house into the home of your dreams. Planning a party, luncheon or special event? From showers and private parties to weddings and galas, French Girl Farm can take your ideas and wishes and turn them into your dream event. A wide range of event planning services are available to make the most of any budget. Smaller, more intimate showers, luncheons and parties can also be hosted at French Girl Farm. Call and schedule your event today. The dining rooms in the farmhouse will soon be transformed into The Tea Room at French Girl Farm. Available by reservations only, The Tea Room will provide a charming and elegant setting that will turn any occasion, even lunch with friends, into a tea party. The Tea Room menu will include quiche, chicken salad on croissants, homemade soups and handmade breads, as well as a selection of teas and coffees. Tea Forté will be the featured tea served in The Tea Room at French Girl Farm when it opens. All of the delicious homemade creations will be prepared in-house in the licensed commercial kitchen at French Girl Farm. Patrons will also experience genuine southern hospitality and first-rate service at The Tea Room at French Girl Farm. While antique china, silver and crystal will add a special touch to what is sure to be a delightful and fun escape from your everyday busy life. The Tea Room at French Girl Farm will be the perfect setting for birthday, wedding and anniversary parties, baby and bridal showers or even lunch with friends. Watch for details on the opening of The Tea Room at French Girl Farm. French Girl Farm is located at 411 S. Main, in Grove. Its spacious corner lots provides plenty of convenient parking in the front, back and side of the shop.